At Team Orthodontics, we are always looking for ways to improve the quality of our patient’s experience. We are proud to introduce the use of 3D imaging software and 3D printing to our in-house lab. What is 3D Imaging software and a 3D printer used for? Dr. Danyluk introduced the use of the iTero intraoral scanner a number of years ago that eliminated the need for taking goopy molds of patient’s teeth. It also exponentially increased the accuracy of the teeth “impressions”. The next obvious step was to take those scanned images and use them for internal appliance fabrication, rather than outsourcing to commercial labs and vendors. 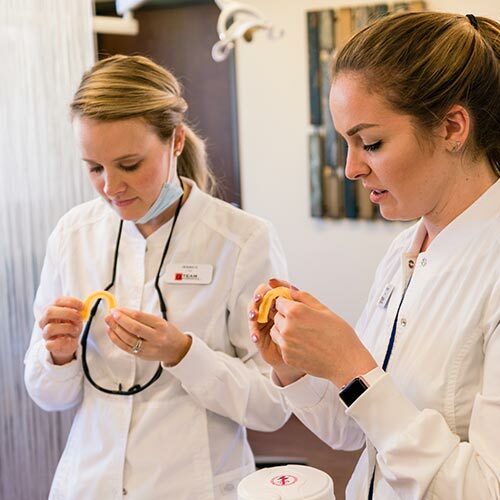 Once the intraoral scan is taken, the digital file can be used on our digital lab software to move teeth, remove braces from teeth and store the encrypted data for future appliance fabrication. Once braces are removed from the image or teeth moved over a sequence of movements, the resulting digital tooth models can be printed on our state-of-the-art commercial 3D printer. From those printed models we can custom create clear teeth aligners, retainers, or custom fit lingual (hidden) braces – virtually all of our orthodontic appliances. If you lose a retainer, that’s ok, we have the original digital file to remake the retainer and get it back to you in no time. What are the benefits of 3D imaging software and a 3D printer?